Your relationship is unique, just like the diamonds that represent it. Imagine a beautiful eternity band on your partner’s ring finger representing the endless love you feel – a showcase of beautifully matched princess-cut diamonds creating a perfect, endless circle. With brilliant shine and a shape perfect for engagement and wedding bands, the princess-cut diamond represents your eternal love and relationship. As one of the most popular diamond cuts, the princess-cut features sparkle and shine unattainable by other square-shaped diamonds. What is a Princess-Cut Diamond? The second-most popular shape for diamonds is the princess-cut -- after the Brilliant Round shape. Princess-cut diamonds are popular for engagement rings and wedding bands as they offer brilliance and sparkle in a modern and glamorous design. Because they are often compared to the round, princess-cut diamonds are sometimes referred to as “Square Modified Brilliants”. Depending on the length-to-width ratio, princess-cut diamonds may also be known as “Rectangular Modified Brilliants” or the aforementioned “Square Modified Brilliants”. A princess-cut diamond features pointed corners and is cut into either a square or a slightly rectangular shape. Inspired by French design, the princess-cut was created in the 1960s and has gained traction in popularity as modern, distinct designs have become more sought after in fine jewelry. The shape of a princess-cut diamond is made up of either 57 or 76 facets (sides). The princess-cut diamond features a pyramidal shape and four beveled sides. This design creates more light dispersion than any other square-shaped diamond and gives the princess-cut a beautiful and highly sought after brilliance. What’s more, princess-cut diamonds are usually cut from extremely well-formed rough diamond crystals. This means that princess-cut diamonds are more likely to be cut from a cleaner rough diamond as compared to other shapes. Are Princess-Cut Diamonds Less Expensive Than Round? The princess-cut is typically a more affordable option when compared to round brilliant-cut diamonds. This is due to the fact that the princess diamond cutting method retains much more of the rough diamond. A princess-cut diamond will retain about 80 percent of the rough diamond, whereas a round-cut will only retain 40 percent. This difference makes the princess shape popular among diamond cutters – and the consequently lower price is popular among consumers. Like the round shape, princess-cut diamonds hide inclusions and other flaws fairly well. On the other hand, princess-cuts tend to retain more color. Thus, the setting usually plays a larger role in selecting a princess-cut diamond. Luckily, the princess-cut lends well to a variety of settings, from vintage bands to more contemporary designs. 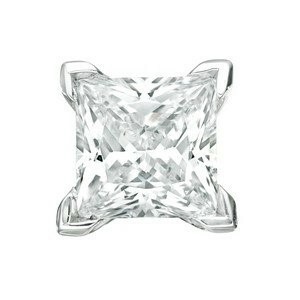 Overall, the round shape is more popular, but the princess-cut is usually more affordable. At Zales, we rely on the trusted experts at GS Laboratories (GSL) to grade our precious stones. The weight of the diamond is measured using the carat system. GSL uses specialized scales to ensure an accurate weight measurement with weights measured to the hundred-thousandths of a carat. In the carat system, one metric carat is equal to 0.2 gram. That's why expert measurements and calibrated tools matter so much when it comes to determining diamond quality. Because of their shape, princess-cut diamonds tend to have a higher carat-weight for their size when compared to their round shape counterparts. Princess-cut diamond clarity refers to the appearance of the stone, noting any blemishes or inclusions. The GSL grades square diamond clarity as one of six grades – Flawless, Internally Flawless, Very Very Small Inclusions, Very Small Inclusions, Small Inclusions, or Imperfect. When looking at diamonds, much of the decision process may seem subjective. Many blemishes may only be visible to a professional with highly-specialized equipment. As such, when evaluating the clarity of a diamond, one of the most important factors is whether or not the diamond appears to be clear to the human eye. Some buyers may prefer to know that their princess diamond is certified as flawless while others may not mind minor blemishes invisible to the naked eye. If you or your partner prefer a more flawless appearance, you’ll want to choose a Flawless or Internally Flawless diamond. If small imperfections do not stand out to you or your partner, then a Very Small Inclusions or Small Inclusions grade may be preferred. The industry standard for grading princess-cut diamond color is a system that begins with a D grade (colorless) and continues alphabetically with increasing levels of color to a Z grade. Diamonds are compared to master stones with known color grades. In fact, GSL utilizes master stone sets that are chosen based on rigorous standards then tested prior to use. To the naked eye, diamond color is closely tied to the size of the princess-cut diamond and the setting. Small differences in diamond color are often difficult for the naked human eye to see, but may still account for a large difference in the price of the princess-cut diamond. Additionally, the setting color and material chosen for your princess-cut diamond can make an immense difference in the diamond’s color. Ideally, a traditional diamond should always look colorless against its setting. For this reason, we strongly recommend keeping your setting options in mind when shopping for your princess-cut diamond and evaluating its color. In general, princess-cut diamonds tend to retain color better than round diamond cuts. The proportions of a princess-cut diamond determine how brilliantly the diamond will shine. Grading of a diamond’s cut is determined by examining its angles, facets, and polish. Overall, the goal of attaining a good cut of diamond is to create a diamond that has the correct proportions to allow the maximum amount of light to travel through. This will give the diamond a beautiful sparkle that your partner will love. 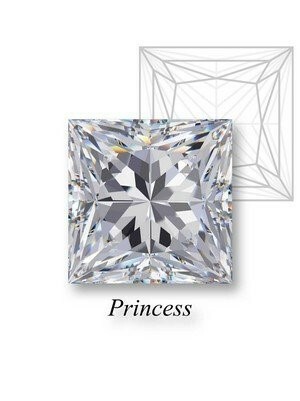 Similarly, the goal when cutting a princess diamond is to create a finished product that is not too deep or too shallow, with a balanced number of chevrons. A princess-cut diamond with too many chevrons on the pavilion side may take on what is referred to as a “crushed ice” look. Each diamond is given one of the following grades for its cut: Ideal, Excellent, Very Good, Good, Medium, Fair, or Poor. A high-quality diamond cut will feature proportions that allow optimal light reflection through the crown and table – giving off a beautiful, brilliant sparkle. The princess-cut shape was inspired by the early “French” cut. This diamond shape featured a series of unique, chevron-shaped facets that give off a distinct cross-shaped reflection when the stone is viewed directly through the table. Still, the modern princess-cut is a relatively new diamond cut. It has evolved throughout the second half of the 21st century with contributions and improvements made by several international cutters. First conceptualized in the 1960’s, an early version of this shape was used in connection with another cut: the “profile” cut. Arpad Nagy, a London diamond cutter, is credited with creating the “profile” cut in 1961. Almost a decade later, Ambar Diamonds in Los Angeles began cutting and distributing the quadrillion cut of 1970, an impressive square cut with 49 facets. Then, expert South African cutter Basil Watermeyer created the Barion cut of 1971. This diamond cut featured a square cut and rounded corners. Finally, Israeli diamond cutters Ygal Perlman, Betzalel Ambar, and Israel Itzkowitz further popularized the “French” cut. In 1979, they created the modern princess-cut we know and love today. Following the creation of these early models of the princess-cut, years of optical research yielded the now-popular modern princess-cut: a square stone with faceting and brilliance similar to that of a brilliant round-cut diamond. For those looking for a beautiful and modern diamond, the princess-cut may be the perfect option. The versatility of the princess-cut lends itself well to a variety of settings. For example, the princess-cut is especially popular for engagement or wedding bands as the shape allows stones to be set side-by-side without gaps. The princess-cut is the second most popular diamond shape on the market today. Accounting for 23 percent of online searches for diamonds, the princess-cut is often considered a more distinctive and glamorous option when compared to the more popular round brilliant-cut. Though frequently compared to the round shape, the princess-cut features unique faceting styles completely different from round-cut options. Due to the more rectangular shape, princess-cut diamonds can have stones set side-by-side with no gaps. This makes the princess-cut diamond popular for engagement and wedding bands, most notably as used in infinity bands -- one of the more popular band styles for many couples today. For the diamond that makes the statement you want, shop Zales selection of high-quality princess-cut diamonds.